It’s a common phenomenon for artists to be adept jugglers, managing multiple balls in the air to survive. A book I’m reading ‘The Artist as Cultural Producer’ by Sharon Louden highlights 40 artists who do it very well. It’s been a dizzy time juggling different strands of my practice and feeling excited by opportunities that have come my way. 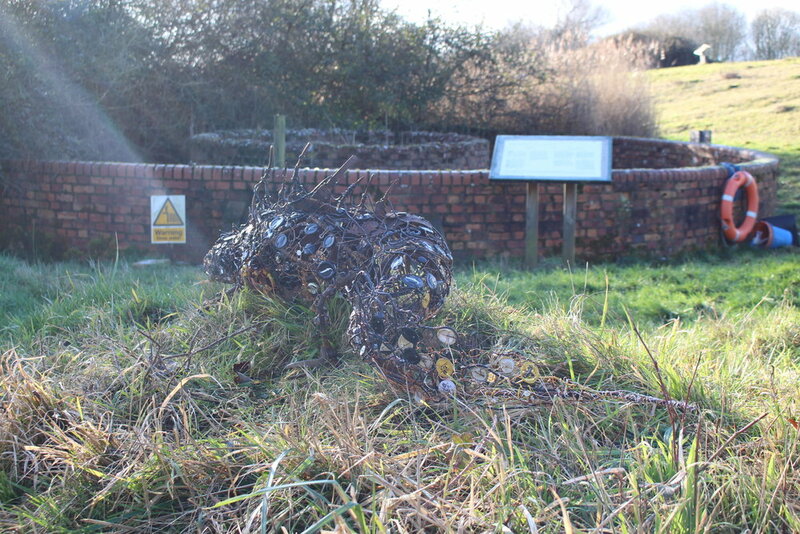 I installed my Great Crested Newt sculpture in his new home at Carymoor Environmental Trust. Made from recycled and found materials, he sits on a grassy tussock by an old bomb incineration tank (now pond - home to great crested newts). Here he can oversee his live newt friends who hide underneath the sheet of corrugated steel. The sculpture was commissioned as a memorial to the founder of the environmental centre Hamish Craig. He loved great crested newts and it was finding these on the old landfill site that sparked the beginnings of Carymoor - now a wonderful wildlife and education centre built over a site full of waste. 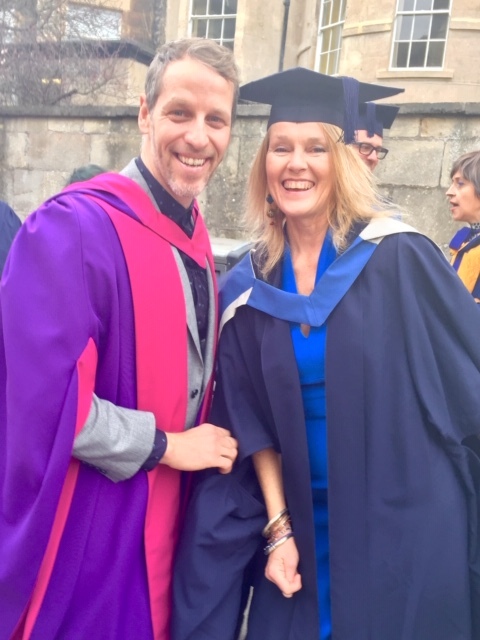 Earlier this month I officially graduated with an MA in Fine Art at a grand ceremony in the awesome Assembly Rooms, Bath, celebrating with fellow graduates. It was a treat to meet our chancellor Jeremy Irons and I was honoured to be invited to give the valediction speech on behalf of our cohort. I managed to do this without tripping up. It was a lovely sunny day for photos - happy memories! Since winning a Gilbert Bayes award from the Royal Society of Sculptors, I’ve been going to London for monthly development sessions. The last with Shelley James focused on writing about our work. The year ends with a group exhibition in London, which tours to Grizedale Arts afterwards - exciting! I try to maximise on my London day trips by visiting exhibitions or museums. I saw Anni Albers at Tate Modern and more recently strolled through the V&A materials and techniques sections, which is mid-blowing. I have spent 2 weekends on an Outdoor Arts Development Course in Weymouth (delivered by Activate, b-side & Bournemouth Arts by the Sea Festival). It’s been fun and informative discussing potential art projects, learning tricks of the trade and thinking up new ideas. I’m now working on a pitch for a potential project which will involve collaboration, to present soon for the forthcoming event Dorset Moon this summer (Luke Jerram's international touring project Museum of the Moon). I’ve made a mini rickety ladder as a maquette. If I don’t get selected I will at least have a cute little ladder for posterity. I quite like making small objects despite normally making huge pieces. A bit finickety but addictive! The wonderful multi-site exhibition ‘Incendiary’, featuring my work, came and went in full fiery mode. 25 artists responded to the firing up of industrial incinerators - a thought provoking exhibition curated by Patricia Brian. Lou Baker and I held an event ‘Join in the Conversation’ as part of it - we were delighted that we had a room packed with engaged people at Stroud Valleys Artspace, discussing our work in context with waste. For my cells residency ‘Offenders’ at Town Hall Arts, Trowbridge (April/May) I’ve made initial sketches, a collage and have started sourcing scrap steel for the skeletal form of a proposed huge Tongue sculpture. Working in the garden on sunny February days has been great. Confrontation with uncomfortable topics related to environmental exploitation will be a characteristic of this residency and exhibition. My work often involves sourcing, sorting and stripping wire. I’ve happily received donations of unwanted materials: pink clothes, towels, wire and fruit nets. Still looking for recycled wax, lead and copper wire. Please get in touch if you have any spare. Other events coming up include a big group show ‘Re-formation’ at the Bishops Palace, Wells, Somerset for Summer 2019, organised by Heritage Courtyard Gallery. I have been developing ideas for this. I’m currently writing an ACE application for a forthcoming project ‘B-Wing’, an arts event being held in the unique spaces of Shepton Mallet prison. Delivered alongside co-curator Luminara Star and several selected artists, we are making progress. B-Wing will involve 5 artists and 1 writer making site-responsive works leading to an exhibition and performances in the B-Wing section of Shepton Mallet Prison during Somerset Art Weeks Festival ’19. The project promises to be quite special and will be a nice follow on from my Cells residency work. We are looking for funds to engage the local Shepton community, schools and various other groups in the area and from afar. More news to follow. I have made a series of little copper bowls for Fosse Beads and Friends, Black Swan Arts, Frome. Each one is annealed and hand beaten. I had fun with tinies (Yrs 1 & 2) at Trinity First School, Frome the other day. Around 120 children made sea creatures in a day using recycled plastic and other found/discarded materials. If you’re interested in more, please visit this link.